Toolbars can be very useful in SPSS. They allow users to do a lot of stuff with a single mouse click. However, some users may feel there's some limitations to their default configuration. An ideal way to get around these is to assemble your own toolbar. By assembling your own toolbar, you can choose exactly which tools you do or do not find useful. 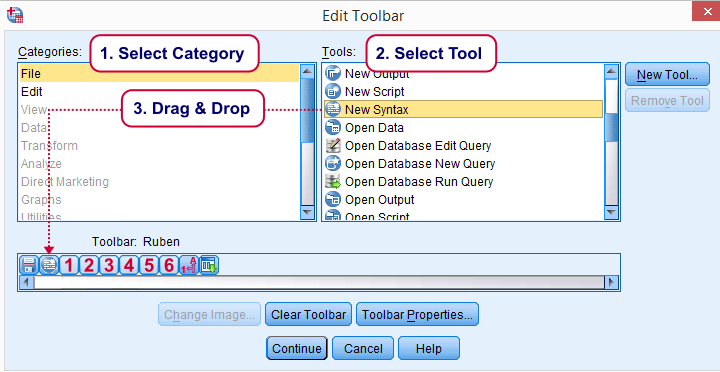 In contrast to default toolbars, you can display your own toolbar in all main SPSS windows simultaneously. The steps described below will quickly walk you through the process. After clicking View Toolbars, you'll see two areas. 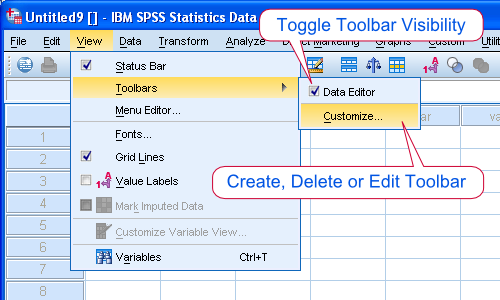 The top area is only for toggling the visibility of those toobars available for any given SPSS window. Since we'd like to create a toolbar, we click Customize. After clicking New we can choose a name for our toolbar and start editing it. Toolbar tools have been categorized. After selecting (clicking) one of the categories in the left main box, all tools belonging to it will appear in the right main box. From there, we can drag-and-drop the tools we find useful onto our toolbar. After clicking 'Continue', we return to the Customize Toolbar window. Under 'Show' each toolbar's visibility can be toggled. Under 'Name' a toolbar can be selected for editing or deleting. 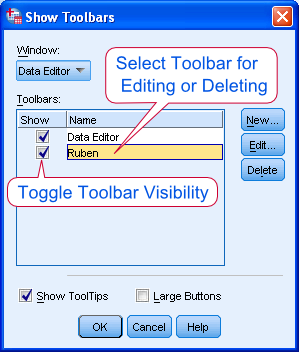 Note that the default Data Editor toolbar can be edited but not deleted. I see. I never heard of entire menus disappearing so I'm unaware of any solution for that. Sorry but I can't help you with that. Sorry. But I meant I don`t have menu up there at all. so there`s no view tab there. Uh... wait. In the menu, there's "View", right? And under "View" there's "Toolbars". Or not? Could you send me a screenshot of what it looks like in your case? Which SPSS version are you using?